We have in store for our customers beakers, which are molded in polypropylene and have excellent clarity and very good chemical resistance. These autoclave beakers have prominently raised graduations on the outer surface, which makes them non-breakable even at high temperatures and under other extreme conditions. We offer a wide range of beaker and beaker covers, which are widely used in various applications of laboratories and other industries. These are fabricated using the best grade PTFE material and are known for their accurate dimension, high strength and durability. Available in different sizes and specifications, these can also be customized as per the specific requirements of the clients. We are instrumental in manufacturing, supplying and exporting superior quality PTFE Beakers. These beakers are used in lab for experiments and medical formulations. unbreakable. Easy to clean. We can also manufacture tall for Philips type and without spout. Capacity (in ml) : - 25, 50, 100, 150, 200, 250, 300, 400, 500, 1000, 2000, 3000, 5000, 10000 ml. It is statically molded from virgin PTFE Beakers and machine finished to give a smooth surface for ease of cleaning and to eliminate contamination. 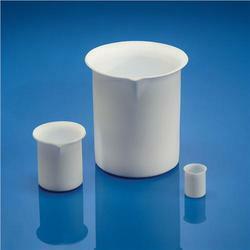 To meet the various needs of the clients, we have been engaged in providing premium quality PTFE Beaker. The offered beaker is used in different industries for several types of works in an efficient manner. Manufactured using the best available raw material, the offered beaker is in huge demand among our valuable clients. 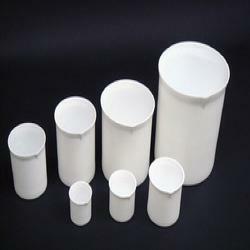 Being the leaders in the industry, we present Ptfe Beakers of fine quality. It is widely used in various laboratories and is available at the most affordable rates. These beakers can withstand high temperatures and have lowest coefficient of friction. They are available with a smooth surface with a broad spout for easy pouring.